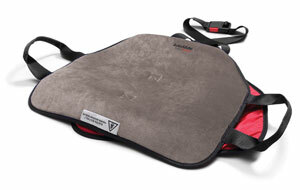 The AutoSlide is used on the car seat to facilitate getting in and out of cars. AutoSlide allows its users to turn and move sideways without great difficulty. If a little more force is needed, there are handles in the sides of the seat cushion to provide helping hands. Secure fitting in the car seat prevents users from sliding forward.